Billy Sharp and Paul Coutts discuss their excitement about the upcoming Steel City derby over a game of pool! Billy Sharp was walking away with the match ball for the first time in a decade but his thoughts had already turned from Wigan to Sheffield Wednesday. "I was joking with my Dad after the game, saying the hat-trick had come one home game too early! But he's a positive influence on my career - he told me to go out and get another one." Sharp, speaking exclusively to Sky Sports alongside team-mate Paul Coutts ahead of Friday's Sky Live Sheffield derby, is laughing but the evergreen United striker is in the sort of form where fantasy feels feasible. He is thriving in a third spell at his hometown club but the 32-year-old is still waiting to win in United colours against his fiercest rivals, as well as score a goal he has dreamed of since he was "about five years old". Any strike will do when the two old foes meet again, he insists - "early, late, from anyone, as long as it gets us in front" - but the numbers so far this season suggest that if anyone finds the back of the net at Bramall Lane, it is likely - finally - to be him. Sharp has scored 10 goals in 14 Championship appearances, a total only narrowly bettered by Brentford's Neal Maupay. That haul from just 23 shots represents a league-high conversion rate of 43 per cent. Most strikingly, Sheffield United are unbeaten in the last 39 league games in which he has netted, and have won the last 20 of those matches. The league's most clinical striker right now credits the productivity of his team-mates in a Chris Wilder system that prizes overloads and triangles; a slow-burn in and around the box that leaves Sharp to prowl the place he knows best and pick his moment. "We're exciting to watch and we create a lot of chances," he says. "I've made a habit of being in the right place at the right time but the balls are coming in. I get the credit but (the second against Wigan) was a great ball from Leon Clarke." Sharp is so far this season playing the role Clarke did last, an unlikely spearhead of another unlikely Sheffield United charge given the budget and resource at Wilder's disposal. Plenty - many of blue-and-white persuasion, but enough wearing his own colours - declared he could not and would not do it in the second tier. But he has and he is, and his knack is enduring. He has scored 214 goals in the league since the turn of the millennium. Only Tottenham's Harry Kane has more than Sharp's 53 in England's top divisions since the start of 2016/17. I'm not eating as many of the kids' chicken nuggets! Physically, I'm in better shape than I was but I think I've adapted to the way the team plays. There is appreciation for his providers but, at his age, the rewards are of his own making, too. "I'm not eating as many of the kids' chicken nuggets! Physically, I'm in better shape than I was - training is hard week in, week out, but I think I've adapted to the way the team plays, being part of the defensive unit as well, rather than just thinking about the goals. "People talk about proving a point but I'm 32, I've been in the game long enough. If I'm proving a point to anyone, it's just to myself; to say, look in the mirror, don't doubt yourself. I'm playing, I'm scoring goals and I'm loving it at the moment." While Sharp is feeling at his peak, Coutts is slowly rediscovering fitness, form and confidence. He had been the pivot in a side that strode to the top of the table in their first season back in the second tier but a Marvin Sordell challenge one November night in Burton left him with a broken leg. "He didn't mean to injure me, he was just trying to block the shot," a reflective Coutts says, as he and Sharp take time out around the training-ground pool table. "The team was playing well, I was playing well... but it's one of those things in football. "There have been a few hurdles to get through - back training, back with the match-day squad, back on the bench, first start; the next one is to try and get back in the team regularly. It's about getting up to speed - your touch, passing; getting used to the tempo and finding your rhythm." Sharp knew straight away, he says. He heard the impact - first on the shin pad and then beneath - and saw the anguish on his team-mates's face. Immediate thoughts were for Coutts the individual but there were ramifications for the collective. Struggling to readjust, so key was the deep-lying midfielder, United gradually fell away, even if play-off hope remained until the penultimate game. "It was hard and it was highlighted the more the season went on," Sharp says. "We missed him immensely but he was still a big influence off the pitch, a voice around the club. He's done tremendously well to get back to where he is." Coutts will have to bide his time, Oliver Norwood currently pulling strings alongside John Fleck and Mark Duffy, but Sharp is bursting to make an overdue impact in United's most anticipated game so far. He had badgered Wilder to make the bench but was nowhere near fit when his team-mates pulled off a thrilling 4-2 win at Hillsborough last September. In January's return fixture - a nervy stalemate, as it turned out - he was fitter but unused, Wilder instead calling on James Wilson, a loanee who had arrived just days earlier and would make only a handful more appearances. So "phenomenal" was the feeling at Hillsborough, missing that afternoon rankles most but Sharp, whose phone has pinged this week with pep talks, taunts and ticket requests, is determined to make up for lost time. "All I needed was a pie and a Bovril and I would have been happier (as a fan) than I was sitting on the bench," he says. "We were cruising and, fair play, Wednesday got back in it, but what Duffy did a few minutes later will live in Sheffield United fans' memory for ever. That's what these games are about, memories for the fans. Hopefully there will be good memories again on Friday." Coutts did play on that "unbelievable" afternoon and, with a boyhood Blade set to be on the pitch as well as in the dugout this time, he has no doubt about his colleagues' approach. "It means so much to the captain and the manager being Blades fans," the Scot says. "The gaffer was pretty pumped up - like he is every week, to be fair. He sets us up to win, there's no talk of going for a draw. We like to go out there and play on the front foot; it's what he demands, it's what the supporters demand and it definitely suits the group of players we've got. "You have to do what you'd do for a normal game but everyone knows it's a bit more than that. I think this one, before the international break, is huge. We'll do our homework, work hard in the week, and then the atmosphere on Friday will speak for itself." The place will crackle under the lights but many in the away end are likely to travel with trepidation. Sheffield Wednesday make the short trip following a demoralising run of four straight defeats and with their manager, Jos Luhukay, under growing pressure. The two clubs appear on contrasting trajectories but there is more at stake than just jostling for local supremacy. After a slip-up at Nottingham Forest last time out, victory on Friday would take the Blades back to the top of the table, overnight at least. "We lost our last game too but there's no better game to put it right," Sharp says. "We're in confident mood - we'll be raring to go." He might dream of scoring in a Sheffield derby, even leaving with another match ball, but skippering his side to three points, in this game of all games, would more than do. 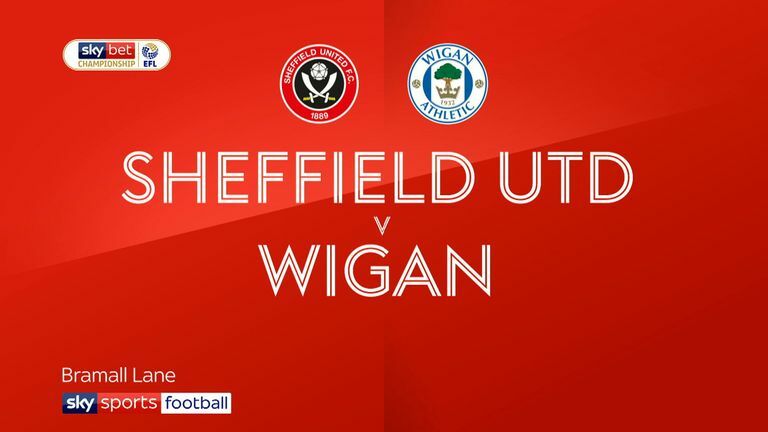 Watch Sheffield United vs Sheffield Wednesday live from 7pm on Friday on Sky Sports Football.